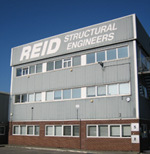 Founded in 1919 by Colonel John Reid, REIDsteel is still family owned and occupies a 4 acre site at Christchurch in Dorset. REIDsteel have been making steel bridges since the 1930s. We have shipped bridges all over the World: from Central and South America, to Africa, the Middle East, Asia, Russia and Europe. At REIDsteel, we are able to design, manufacture, ship and erect almost every type of steel bridge, including beam bridges, over truss bridges, through truss bridges, bow-string bridges, cable stayed bridges and pedestrian bridges. Our bridges are designed and made to British Standard 5400 Highway Bridge Loading Specification, and we have vast experience and knowledge in construction in remote regions, tropical climates, and earthquake and hurricane design. What makes REIDsteel so unique is that we cover everything from the design to the erection process itself, all within our 4 acre site in Christchurch. We have our own unique computer software which has been developed by us for us, which allows us to design and price a building or bridge in minutes rather than months. The machines in our works use the latest CAM systems which have been programmed just metres away in our drawing room. If one of our workmen has a question about a design, they can walk straight up to our offices and ask the designer himself. Using different companies to do different jobs creates a lot of confusion, wastes time and money, and causes endless arguments. With REIDsteel, one company is responsible for everything. Choosing REIDsteel to construct your steel bridge allows it to go from design to construction within 3 months, and be in use and fully functional within 6 months. Going from architect to engineer to contractor means it could be a year or even longer just to get to the manufacturing stage. This traditional route will usually involve using more than one contractor - one for the frame, one for cladding, one for windows, one for doors etc. At REIDsteel we can supply all of the accessories needed for the complete structure without the fuss. At REIDsteel we use Tata Steel rolled to British Standards, which is used by us almost exclusively. We are registered Qualified Steelwork Contractors, having been submitted to a Capability and Capacity AUDIT by the British Constructional Steel Association, which takes into account our assets, plant, skills, experience, turnover, financial status, contract references, product and public liability insurances etc. We received an A rating (highest), which qualifies us to design and make every form of structural steelwork, from multi-span bridges to the largest aircraft hangars to the lightest architectural work. We have received the Queens Award for Enterprise four times, in 1985, 2006, 2008, and 2009. This is the highest honour that can be bestowed on a UK company. Which style of bridge is right for you?